« LHCb reports observation of CP-violation in charm. Welcome New Physics? Or not? What exactly is CP violation? When we look around ourselves, everything is made up of matter – protons, neutrons and electrons. Even looking out into space, all the planets, stars and gas that we can observe is made up of these particles. 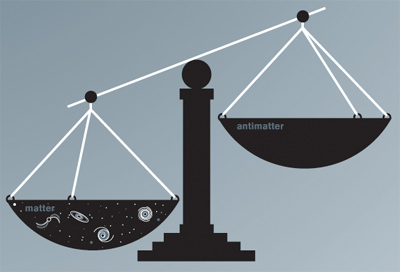 There is a cosmological excess of matter over antimatter which is at odds with the theoretical symmetry between them. The theoretical symmetry between matter and antimatter is more commonly known to particle physicists as CP. If nature treated matter and antimatter alike, then nature would be CP-symmetric. If not, CP is violated. CP is the combination of two other more fundamental symmetries, Charge conjugation and Parity. C is the symmetry between positive and negative charge while the P is the symmetry of spatial coordinates. If we take a particle with positive charge, C reverses the charge, meaning the particle will now have negative charge, and vice versa. Note that if we start with a neutral particle, C will have no effect, since it has no charge. P is a little harder to explain, though more intuitive, as we encounter a symmetry of spatial coordinates every time we look into a mirror. I am right-handed, but when I look into a mirror, my reflection is left-handed. This almost a perfect analogy to the P symmetry in particle physics, which transforms left-handed particles to right-handed ones. So the combination of CP on a left-handed, negatively-charged particle would transform it into a right-handed, positively-charged particle. You may be a little confused as to why I’m describing particles as having a handedness, they obviously don’t have hands or a preference for one over another! It has to do with the fact that all particles have a property called spin, which for simplicity, we can visualise as rotation around an axis. The direction that the particle spins with respect to its direction of motion determines whether it is left-handed or right-handed. So there you have it. What C, and P and CP are and why we are interested in CP violation. Tune in to my next post on one of the ways we can measure it… And maybe the next next post on another way… And maybe the next next next post on yet another way… Yes, we particle physicists are that interested in CP violation! Image credits in this post go to Symmetry Magazine and Flip Tanedo.